The recent progress in magnetic resonance imaging (MRI), providing reduced acquisition time, makes reliable exploration of the urinary tract feasible. To the sequences without injection of contrast medium can be added sequences with injection of gadolinium for a uro-MRI with no iodine injection or irradiation. The exam provides reconstitutions in the different spatial planes (frontal, sagittal, etc.). Although the MRI has no known native implication for the fetus, for reasons of caution this examination is not advised in the course of the first trimester during the organogenesis phase (Louca 1999; Murthy 1997; Spencer 2000). MRI does not display small stones well (Roy et al. 1995) and has the disadvantage of high cost and reduced accessibility to the patient during the study. 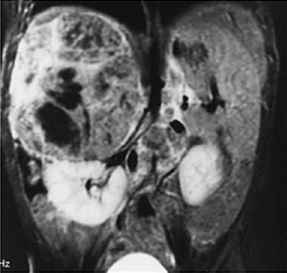 Although MRI is infrequently used in standard urinary lithiasis workups, it can be useful in difficult cases involving pregnant patients (Roy et al. 1995).